Earlier this month, my wife and I took a remarkable trip to Senegal for about a week. We visited Dakar, the capital, then Gorée Island, one of the most infamous sites of the slave trade, then Saly a small beach town about an hour south of Dakar. But the most memorable parts of the trip were our three days with three Senegalese families studying their food culture. The following reflections consider where Senegalese and American food systems are now, and may be headed, with lasting consequences for public health. 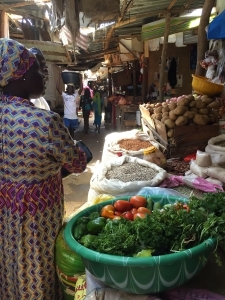 Since fall 2017, Georgetown University Medical Center community health fellow, Dr. Melissa See, and I have been collaborating on research comparing the food cultures of three lower-income African American families in Washington DC with three lower-income Senegalese families in Dakar. Combining observation, interviews plus photo and video data taken over several hours with each family, we are studying how these six families participating in Learning Life’s Citizen Diplomacy Initiative (CDI) shop for, cook, and eat their food, and the meanings they attach to these practices (i.e., their food culture). Dr. See is conducting the research with the three African American families while I conducted the research with the three families in Dakar with my wife’s able assistance. Our hope is that this research will deepen our understanding of the diet-related challenges our CDI families face in living healthy lives in DC and Dakar. This concern grows out of Learning Life’s turn toward community health as a focus of CDI work. Health is fundamental, and it’s a serious concern in many lower-income communities worldwide. Health also connects to so many forces — like culture, business, politics, and the environment –in interesting ways that can help us better understand our world. (More on health, and particularly community health, in an upcoming post). Food, in turn, is central to health, so studying food culture is helpful to identifying families’ health challenges and opportunities. One of the most striking differences we’re finding in the food culture of the Senegalese and American families is in the processing, packaging. 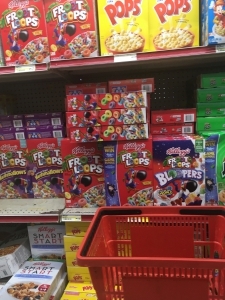 Like many Americans, our CDI families in DC generally eat a lot of processed, packaged foods. 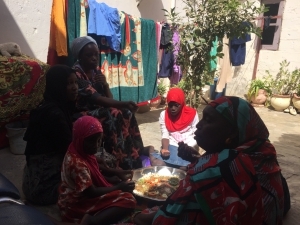 In contrast, the Senegalese families’ food we observed was on the whole far less processed and packaged. Americans of all income brackets are typically used to shopping at supermarkets with lots of packaged, processed foods. In Senegal, by contrast, there are far fewer supermarkets per capita. 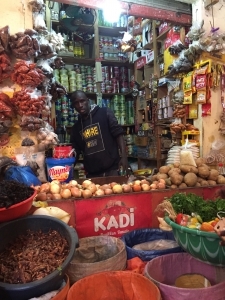 When we went shopping with one of the Senegalese families, we went not to a supermarket but to an open air market with many merchants selling fruits, vegetables, meats, spices and many other foods, most minimally packaged, and unrefrigerated. These striking contrasts do not necessarily mean one country has it better when it comes to food. Americans might assume we have the best food system in the world, and ours is indeed among the best in food safety, abundance and affordability. However, our mainstream diet of cheap, processed foods high in sugar, fat and salt — the sodas, chips, burgers, pizzas, donuts, cookies, cake, ice cream, etc. we eat in abundance — generate all kinds of widespread health problems, including obesity, diabetes, high blood pressure, heart disease, cancer, and stroke. The Senegalese diet is less varied, high in starch — mainly rice but also other cheap grains — and less safe due to lack of refrigeration and standardized food safety practices (e.g., cleaning, disinfecting, cooking at safely high temperatures). Nonetheless, the Senegalese obesity rate is around 9% vs. 36% in the USA. The Senegalese live much shorter lives on average than Americans — 62 vs. 80 years, respectively — but living longer does not necessarily mean living better. Many factors affect health and longevity: not just diet but activity levels, the number and quality of one’s relationships, air and water quality, housing conditions, transportation safety, crime levels, education levels, the availability and quality of health care resources like doctors, hospitals, parks and gyms, etc. However, to the extent that our diets are central to our health, major food companies that sell processed foods high in salt, fat and sugar pose a serious threat to global health that often goes unrecognized. Besides the obvious threats — fast food chains and convenience stores that market and sell cheap, tasty but unhealthy food products — the modern supermarket presents less recognized problems. To their credit, supermarkets commonly sell fresh produce, even if there may not be many varieties of fruits and vegetables, and much of it may not be local or even domestic. However, most other food aisles of any supermarket are filled disproportionately with processed foods high in fat, salt and/or sugar. Why? Such food is generally cheap to make, “shelf-stable” (lasts long without going bad), can be manipulated easily (new flavors, different quantities and types of ingredients) to cut costs and boost appeal, and tastes good to most consumers. These are the main reasons why food companies sell processed foods high in fat, salt and sugar. The abundance of packaging that envelopes many processed food products serves three key functions. First, packaging is a vehicle for advertising to seek to distinguish the product, attract consumers and build “brand loyalty” (consumer loyalty to the company’s product or product line). Second, governments often require companies to reveal certain information on their packaging, such as the ingredients in and nutritional content of their products. Third, packaging helps preserve food products and protect them from contaminants in the environment. Despite these functions, food company packaging is often excessive, and contributes substantially to resource waste, environmental pollution, and the world’s ever mounting trash heaps. Perhaps the most important point to keep in mind though is this: like most businesses under capitalism, the primary goal of food companies is not environmental health nor the public good, but profit. This does not mean businesses are evil, but it does mean they are self-serving. Furthermore, they are rationally single-minded and tireless in their pursuit of profit. For these reasons, businesses, alone or in concert, tend be very powerful actors who do their best to shape resources, markets, laws and consumers to their profit-seeking ends. This makes it hard to underestimate the extent to which the food cultures of Americans and other higher-incomes peoples are shaped by food companies. Many of the healthiest foods — whole foods like apples, pineapple, carrots, broccoli, beans, nuts – require minimal processing, are not shelf-stable, cannot be easily manipulated, and do not taste as good to consumers because people are naturally drawn to foods high in salt, fat and/or sugar. Hence, supermarkets grudgingly sell whole foods, but tend to make their best profits from packaged, processed foods. As the Senegalese and other peoples of developing nations increase their income, international food companies will be more attracted to them in search of profits, and they will bring their familiar fast food chains, convenience stores and supermarkets with them. That will mean more processed foods high in salt, fat and sugar, and accordingly, more obesity, diabetes, high blood pressure, heart disease, cancer, and stroke. 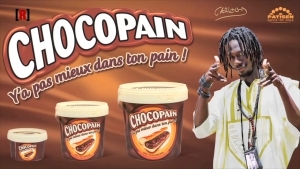 Already, an ambitious Senegalese food company named Patisen is pervasive in homes, markets, and on street billboards in Dakar. Further, Patisen is working to bring its line of sauces, spreads, condiments and drinks high in salt, fat and/or sugar to other West African countries, with the help of the World Bank’s International Finance Corporation. The same trend is happening worldwide wherever incomes are rising, including much larger nations like India and China, where diets are becoming more processed, and diet-related diseases are consequently rising. Nothing is inevitable, yet profit-seeking food businesses are powerful players whose answer to the diseases they help create are a plethora of processed “health” and “diet” food products that are not necessarily healthy, and are certainly not whole foods. Fortunately, there are plenty of smart food critics writing influential articles and books (e.g., Michael Pollan, Marion Nestle, Eric Schlosser, Michael Moss), a growing body of popular food documentaries (e.g., Food Inc, Forks Over Knives), and encouraging socio-economic trends, like slow food, local food, organic food, farmers’ markets and urban gardening. The secret to fighting the food industry giants may be more of this — reading, talking and acting locally and internationally for whole food diets and a healthier planet. International Finance Corporation. 2011. “IFC Invests in Senegal’s Agribusiness Sector.” Retrieved April 1, 2018. Central Intelligence Agency. “Africa: Senegal.” World Factbook. Retrieved March 31, 2018.